The Admin Center provides for management of the TIM Tools suite of applications. The Technology Uses and Perceptions Survey provides essential information for planning technology infrastructure and support and identifying the perceptions and PD needs of teachers. These three tools are for classroom observation, lesson plan review, and teacher reflection. The ARTI tool provides a framework for teachers to design and conduct their own action research projects. The Report Tool allows a school or district to create TIM-LP, TIM-O, TIM-R, or TUPS reports. 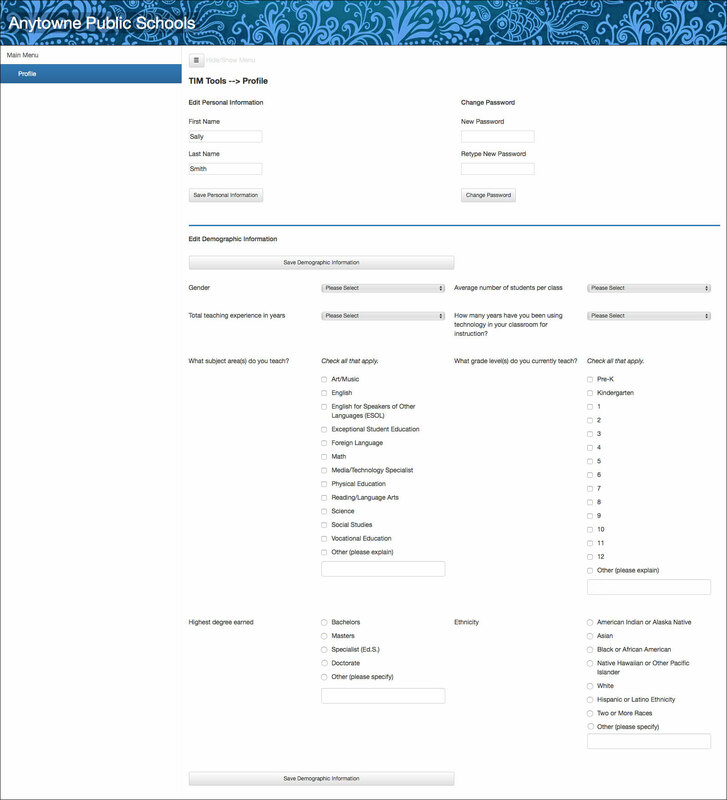 The Survey Tool allows a school or district to create internal or external surveys on new topics as needed. Members who would like to edit their own personal or demographic information or who would like to change their password should select the Profile link located near the top right corner of the page. This will open the Profile window. Figure 1. Link to the Profile window is in the upper right corner. Users who do not have any administration rights will not have an Admin Center link there. Editing names. Change the first or last name in the text fields and then click the Save Personal Information button. Changing password. Enter a new password twice in the appropriate text fields and then click the Change Password button. Updating demographic information. Members can enter their own demographic information here. This information is available systemwide and will prepopulate the appropriate section of the TUPS saving members from having to re-enter the same information each time they take the TUPS. Figure 2. The Profile window as seen by an individual member.